If you’re feeling nervous about what December has in store for your nutrition, then you’ll want to have the right holiday eating tips on your side. These handy little tricks can make the difference between making the right choice or the destructive one. This doesn’t mean that you’re going to have to give up on all the meals and treats you love. However, it can help you to control your intake and reduce the harm overindulgence can cause. As much as we’d like to resist, we also need to be realistic about participating in – and enjoying – the season. Use these holiday eating tips to help you out this year. Casseroles are delicious. Sweet potato casserole, green bean casserole and others are a delicious tradition for holiday meals. That said, their names can be deceptive. It may sound like you’re opting for veggies, but the additional ingredients they contain can offset the benefits they’d otherwise provide. For example, remember this among your top holiday eating tips: sweet potatoes are fantastic for you, but the butter, brown sugar and marshmallows that make up the rest of the casserole sure aren’t! Take enough for two good sized bites but don’t use it to fill you up. That way, you’ll have enough to truly savor the flavors without skyrocketing your fat, calorie and sugar intake. 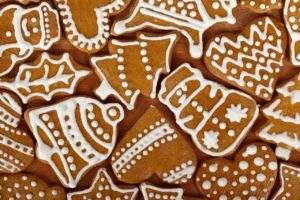 This is one of the toughest holiday eating tips for people with a sweet tooth. That said, it can be very handy. As strange as it may seem, try to create a cookie/treat priority list. Truly think about the treats you love the most and absolutely want to enjoy this holiday season. Focus on your favorites. When it comes time to enjoy them, have one. Just one. Take small bites and focus on the flavors and textures. Actually experience it. You’ll find that after the first two bites, the enjoyment levels off, and it’s just a matter of eating something tasty. Therefore, if you were to take another one, you’re only fooling yourself into thinking that you’ll have more enjoyment. It’s more a matter of habit and craving than actually loving what you’re eating. Choose specific times when you’re allowed to have these treats. This is a powerful trick among holiday eating tips. If you tell yourself you can have sweet treats only for dessert, this will stop you from using them to fill up as a snack. You’ll have one and savor it after you’ve already had a satisfying meal, making it easier to stop.